The common dialogs OCX is probably the single most dispensible dependency there is. Long ago, Bruce McKinney wrapped up most of the common dialogs as easily callable functions. Over the years, I've taken those as starting points, broken them free of their own various dependencies (Bruce loved typelibs! ), and augmented them a bit. As they're ready to be rolled out, I will offer them here for your download enjoyment.
' if not the standard.
' Let user pick new backcolor for label.
' Update custom color display. 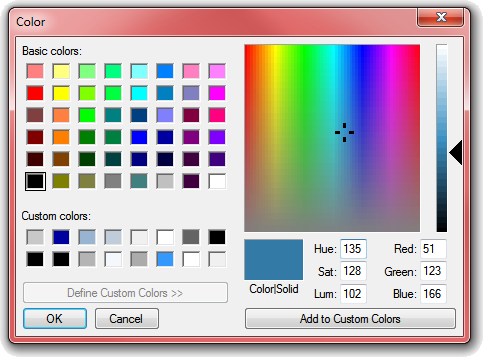 Start by assigning the starting color to a variable you'll pass to my ChooseColor function. This variable will also hold the final color when the function returns successfully. Decide whether you want to enable the optional features, like showing the dialog fully open, or preventing it from opening at all. The second parameter (AnyColor) is pretty useless on full-color displays, which are ubiquitous now, but could force solids rather than half-tones when on a 256-color display.
' 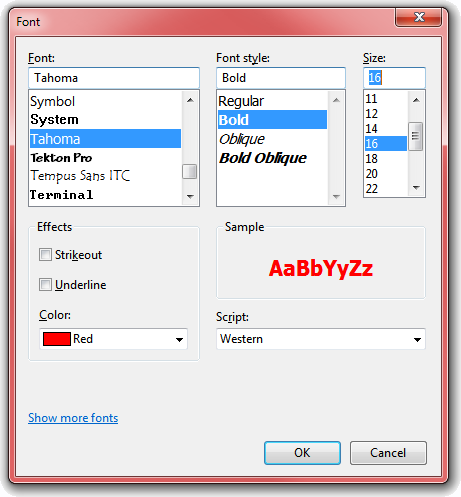 the font object we want to change.
' Set the flags we want to use.
' Only use scalable fonts, omit ones like MS Sans Serif?
' an attribute of the label and not the font. The GetFontChoice function is designed such that it changes the attributes of a passed Font object to match the user's selection in the common dialog. Hard to get much simpler than that! Stay tuned here, as I intend to get the File Save, File Open, Color, and Find/Replace dialogs up shortly.
' Classic VB source files or to show all files.
' Base toggle options on user checkboxes.
' Avoid clutter in Recent Files list. cboFiles.AddItem "User cancelled Open File selection dialog." There are numerous options to the GetOpenFileName call, most of them optional. Be sure to see the VSM Online articles listed below for more details on the implementation. The MCommonFile.bas module also contains the beginnings of a File-Save dialog routine. I'll be cleaning that up, and adding that here next. Stay tuned.